All the riveting I’ve done, had one person inside bucking and the other running the gun outside. Did they have someone inside bucking and how did they keep him cool? It must have taken him a long time to get ready to work at the start of his shift. Thanks for the question about how did HMCo buck the rivets from inside the spar. I’ve heard Halsey Herreshoff mention that they had a young lad crawl inside with a lanyard attached to his ankle to haul him out if he were overcome. 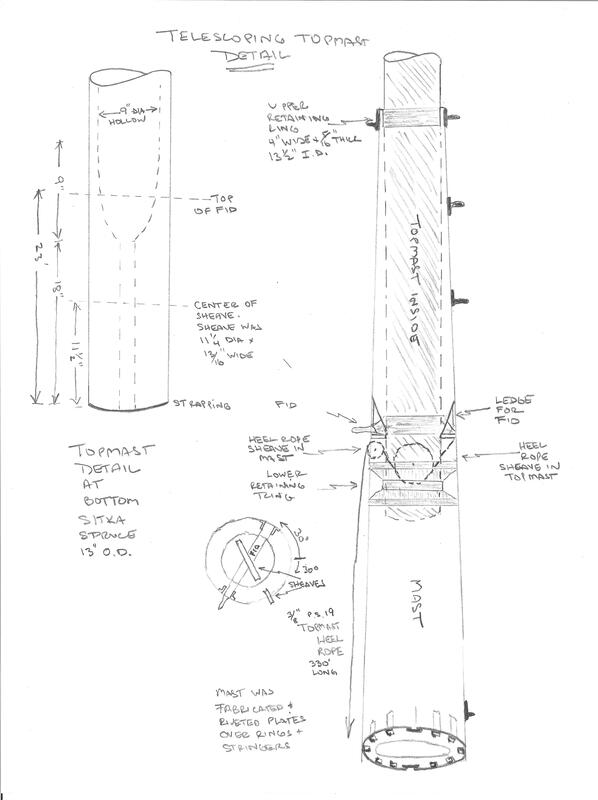 I enclose a sketch of the boom construction, noting that at maximum diameter it was 21 inches, and of course tapering at each end. The gaff had a maximum diameter of 13.5 inches and tapering. The hole in the rings through which this lad would have had to have crawled was a maximum of 15 inches for the boom and 9 inches for the gaff. So, I’m not sure about the lad, but if you have a spare child hanging around maybe we could arrange for a test! 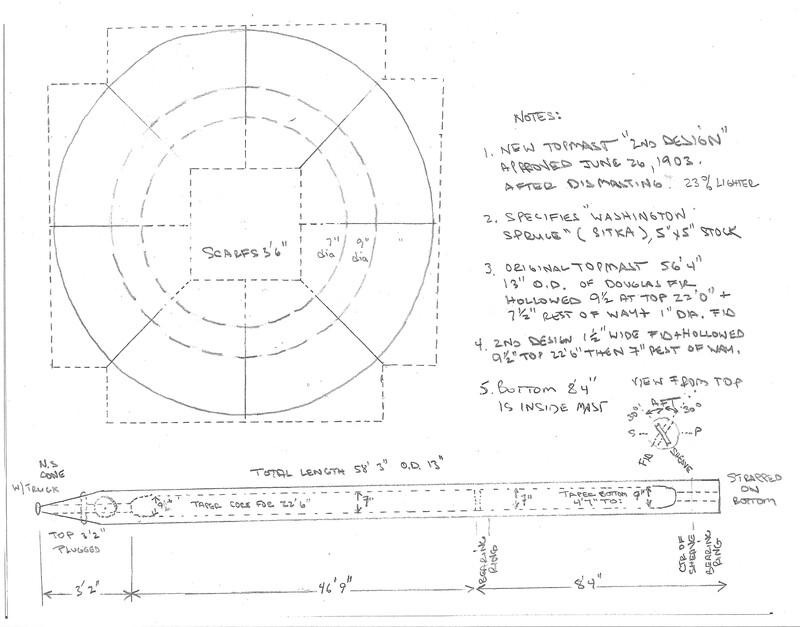 As seen on the drawing, the upper half-round and lower half-round 14 foot long plates overlap, so at least one half of the 7 foot overlap could be riveted in the open. No problem. I have to believe therefore that HMCo had some sort of jig that could be inserted to “buck” the inside when the next overlapping plate was added. 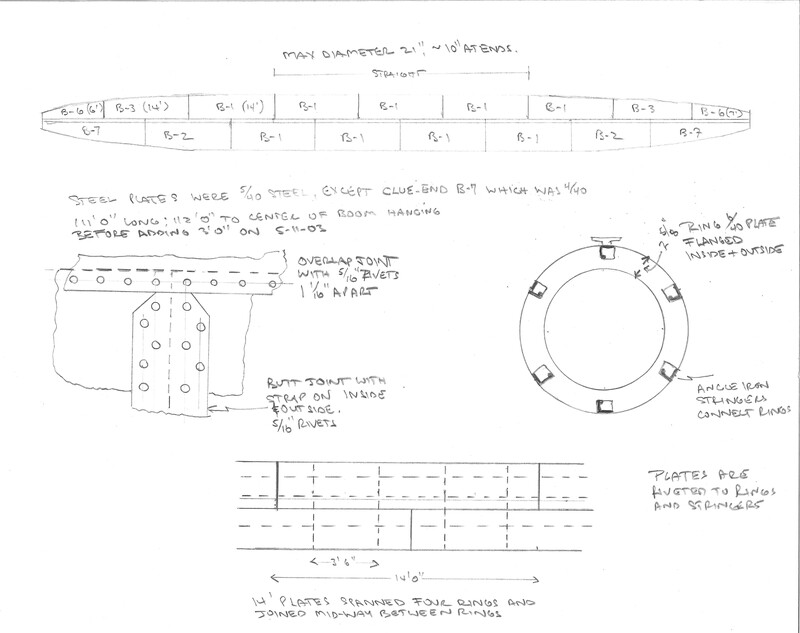 But, then again maybe HMCo had “buckles rivets?” Perhaps someone knowledgeable about riveting could help us, PLEASE! We note that rivets on the mast, boom and gaff (as well as hull) were ground flush. Can’t see them in any pictures and therefore you couldn’t see them in our model scale – WHEW! My riveting experience has been heavy in the aircraft field but I’ve also done some steel riveting as well. The rivet is pushed through the hole in the two pieces of structure and held in place w/ the pneumatic rivet gun. The bucker holds a heavy bar against the small end of the rivet and while the man w/ the gun holds the rivet all the way in the assembly. When both men are ready, a burst of hammering w/ the gun mashes the small end of the rivet. A properly driven rivet expands to fill the assembly and also has the small end mashed so that it holds its position. Steel rivets are usually driven red hot but otherwise the process is the same. In either case, there is continuous communication between the team doing the riveting. Improperly installed rivets must be drilled out and replaced. I shudder to think about rescuing a riveter who passes out from heat or fumes inside a 100′ pipe after crawling through a bunch of 15″ rings. Today there are one-side rivets for aircraft and likely for industrial applications as well but I never heard of such way before WW-1. I with you, but I cannot believe that someone small enough could fit inside the boom or gaff since the maximum diameter of the hole was 15″ in the former and 9″ in the latter; and then each had significant lengths with tapering. Must have either had an internal jig or single sided rivets. Other turn-of-the-century industries must have riveted pieces together in confined spaces. Steam engines, ships? Wonder what their solution was? Perhaps it is all in the assembly technique? I don’t know, but like you have wondered. BTW “buckles rivets” should have been “buck-less rivets” in my first note — but my cellphone decided it could correct my spelling and I didn’t catch it. Technology is so great – the human interface can make errors at the speed of electrons!